Back in the 90s, Rhino Records put out a series of compilation albums under the name "Golden Throats," which focused mostly on celebrities who did ill-considered covers of popular music. I like the series, in part because of its undeniable camp charm (as an example, it featured Mae West's geriatric purring on her cover of "Twist and Shout"). But, often, I just genuinely liked the songs. They were often funny, and not always accidentally, and more than a few of them were genuinely terrific, in an inevitably idiosyncratic way. The third collection was titled "Sweethearts of the Rodeo" and featured surprising covers of country songs, and I've been collecting these sorts of celebrity renditions of country westerns songs ever since. I will be returning to this subject, as there are enough examples of this for me to be able to continue to write about it until the heat death of the universe, but I'll start with five notable examples. Eddie Albert is probably best remembered as the star of the sublimely surreal "Green Acres," in which he played a big city attorney retired to the life of a gentleman farmer in a gently bonkers farm town. Far from an urban sophisticate, Albert was actually a Midwestern boy, with a childhood in Minneapolis and a degree from the University of Minnesota, who somehow wound up working as a trapeze artist and a nightclub singer before finding success as an actor. Albert was also an early conservationist, and, in general, an interesting man. In 1966, Albert put out an album titled, simply, "The Eddie Albert Album," filled with the sorts of songs interesting people listened to back then: Bob Dylan, Simon and Garfunkle, Anthony Newley. He also included Donovan's song "Colors," the sort of earnest folkie tune that caused Dylan to make fun of him. Albert turns the song into a spare country number, leaning heavily on a duet between arpeggiated guitar chords and a melancholy harmonica. A baritone chorus kicks in at some point, but mostly the song relies on Albert's recognizable, practiced voice. He's not a terrific singer — he tends to end his verses with a warble rather than a vibrato — but he's a pleasant singer. Film actors Walter Brennan wasn't a singer, and so, on his albums (he produced three between 1960 and 1962), he simply talked over instrumental music. But that was fine, as Brennan's voice was one of the most distinctive in Hollywood. Although born in Massachusetts, he had developed what can only be described as a toothless prospector's voice, and he used it to great effect, winning three Oscars. He charted with four of his songs, but we're not going to concern ourselves with those. No, instead we're listening to "Old Shep," a maudlin telling of a dog's death told with a broken voice over guitar, harmonica, mournful chorus, and country gospel organ. The story is meant to be heartbreaking, but Brennan sells it too hard, sounding like he's in the middle of a nervous breakdown. It's not helped by some unusual locutions — Brennan can never simply mention Shep's head without calling it "Shep's faithful head," and by the chorus suddenly belting out "Now Old Shep has gone where the good doggies go." Web Pierce was one of the greats of Honky Tonk, as famous for his excessive lifestyle as for his music, which took its toll — by the time of his 1976 duet album "C&W," his voice was partially ruined, thin and disengaged. Not that it mattered that much, because the album was already so odd that a little vocal weakness on Webb's part wasn't going to affect anything. Specifically, the album is a series of duets with Broadway warbler Carol Channing, whose voice always sounded like someone doing a slightly mean Carol Channing impression. "I Ain't Never" is an uptempo number with a wah-wah guitar and deep, brassy harmonies from a country choir. The results are undeniably odd, but charming. The classically handsome John Davidson has spent his career mostly as a host for game shows, as well as a memorable turn cohosting "That's Incredible," a precursor to reality TV that focused on odd humans doing odd things, with occasional side-glances into the world of the paranormal. But Davidson started off as an actor and singer and occasionally returned to it; he even managed to place a few songs on the adult contemporary charts in the 1970s. All the way back in 1964, he released an album called "The Young Warm Sounds of John Davidson" featuring his cover of the Hank Williams' standard "Hey, Good Lookin'." The production is very '60s, full of bouncing bass and jazzy orchestral swings that wouldn't sound out of place on a Julie London album. Davidson's voice is indeed young on this track, sometimes sounding a bit like when the Monkees would parody ragtime songs, sometimes sounding like when Bobby Darin would impersonate a crooner. 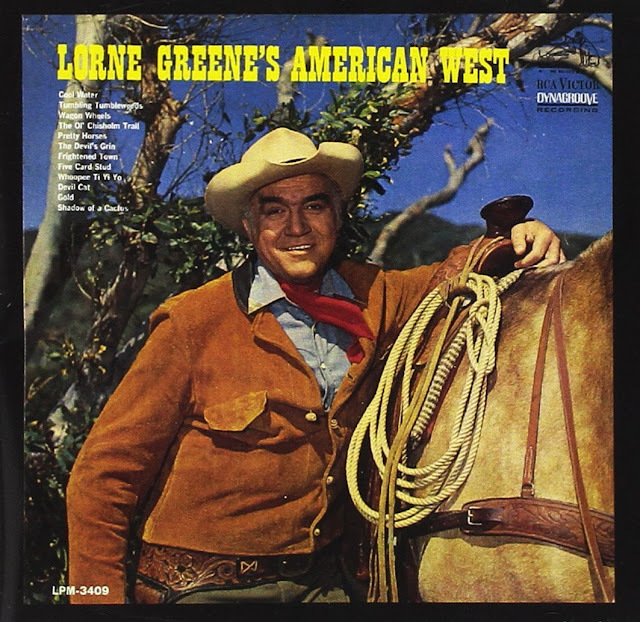 It's not surprising that Lorne Greene, star of "Bonanza," might put out an album of western music; neither is it surprising that the actor chose to narrate, rather than sing, many of the songs. What is surprising is that "The Devil's Grin," from his 1966 album "Lorne Greene's American West," is so good. Over a backdrop of Spanish guitar and cowboy movie horns (and occasional kettle drums), Greene tells of a gunman who has faced down more than his share of psychotic killers in the west, and has come to recognize their murderous smile. Every time he mentions this psychotic rictus, a chorus of voice cries out "The Devils' Grin!" It's weirdly haunting, especially at the song's climax, when Greene sees that grin one last time, reflected in a mirror.